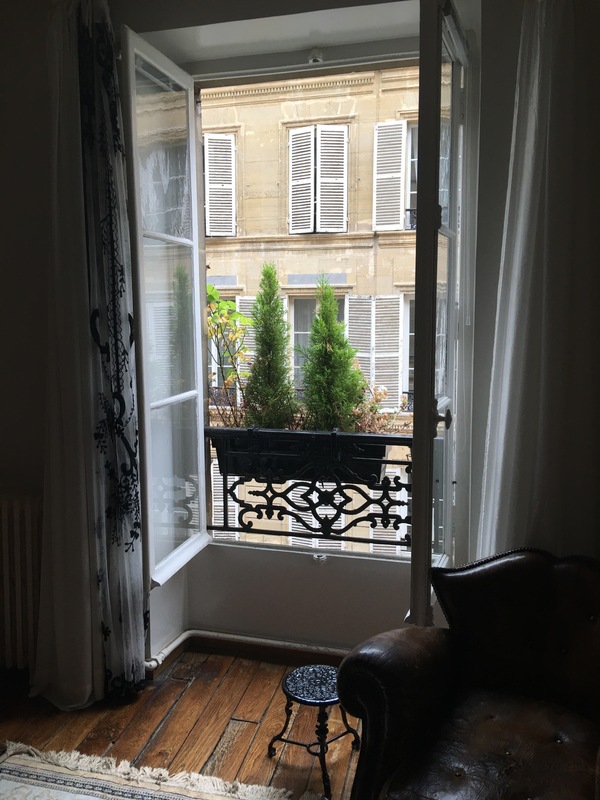 We rented a cute little apartment in the 2nd Arrondissement (district) to stay in while we were in Paris. On our trip we’ve stayed in a variety of places that all have their positives and negatives just like anything. Hotels are more consistent and come with staff that make it easy to ask questions, find things to do, or get directions. Apartments are great because there is a kitchen and also there is at least one bedroom which makes it nice to spread out and have some personal space. 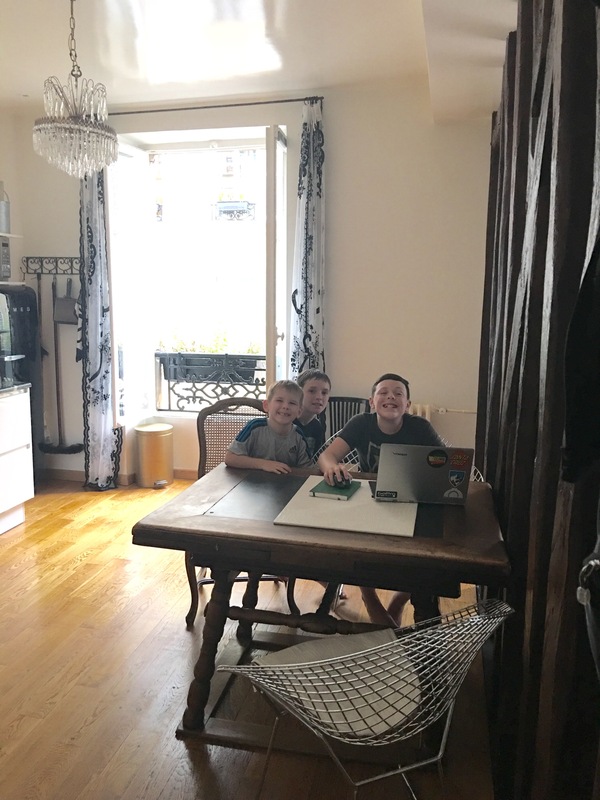 Jeromy did a great job on Air BNB picking out our apartment in Paris, wooden beams, shuttered windows looking out on the street below, surrounded by tons of shops and restaurants, and across from the best crepe place in town. What more could you ask for?! One of the highlights of our trip to Paris was meeting up with our good friends Abe and Holly! They just happened to be traveling there the same time as us and we were able to meet up a few different times. 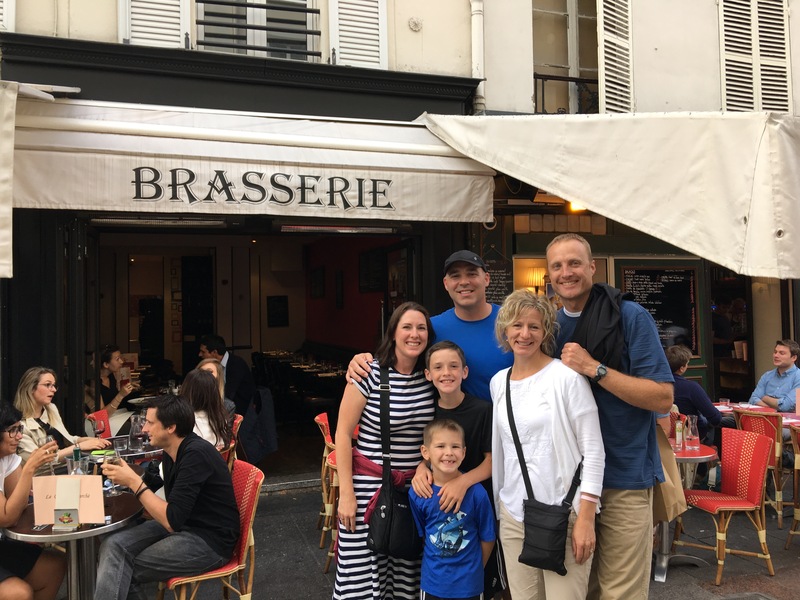 It seemed unreal to say, “Why don’t we meet in front of the Notre Dame.” Or “Should we get fondue in the Latin Quarter tonight?” We never would have thought we would be saying those things to each other when they invited us to their house for dinner 10 years ago in La Center, WA! We even got to go to church together just like the old days! Our first night when we arrived everyone was hungry and it was late. 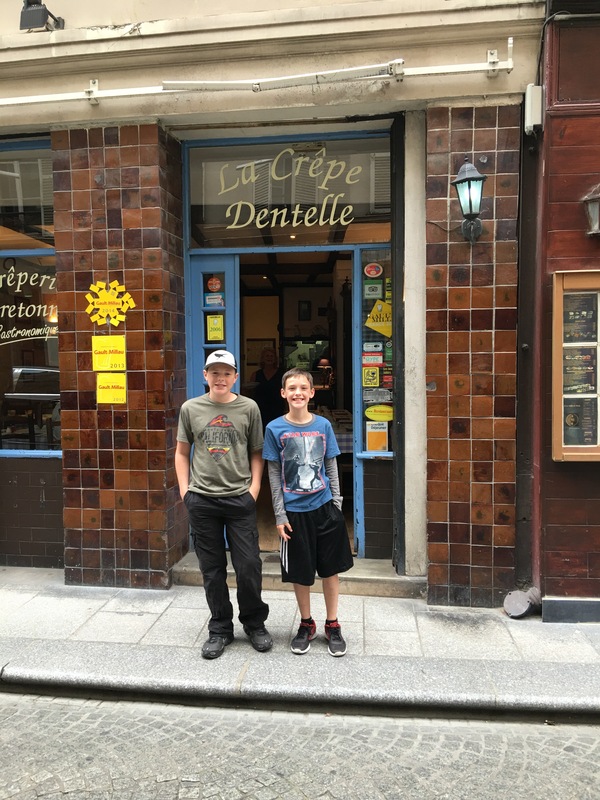 We quickly checked Yelp and saw that the restaurant across the street, La Crepe Dentelle, was rated really well. That night we had the best crepes ever! Homemade caramel sauce, yes! Nutella, yes! Whipped cream, yes! I was curious and looked up what “dentelle” meant in English and it means “lace.” That is a perfect description of the crepes made there, by an old French man, who spoke almost no English, but was able to communicate his loving and generous spirit to us through his wonderful smile and delicious crepes. We’ve had a lot of crepes on our trip, and so many have been delicious, but none compare to the lacy goodness of La Crepe Dentelle. Not everything is no worries and sunshine when you are traveling. One big concern we had about going to Paris was terrorism due to the recent attacks throughout France and other parts of Europe. I felt a palpable tension in the people while we were there, you couldn’t help it. There were armed military wandering through tourist areas and metal detectors and pat downs before entering major historic sights. While it was a bit disconcerting, it was also reassuring to know they were taking the threats very seriously. In fact, as we arrived at the Eiffel Tower to go up at sunset one night, the whole thing was surrounded by military and closed off. We hightailed it out of there and decided to go up the Arc de Triomphe instead. We later learned that the closure was due to a suspicious package. At times when I was in a crowded place, or especially in the Metro, I was definitely watchful and a bit uneasy. Fortunately, we were safe while we were there, but we just heard of an attempted attack at the Notre Dame Cathedral and at the train station where we arrived into the city. Amorino gelato, shaped like flowers! 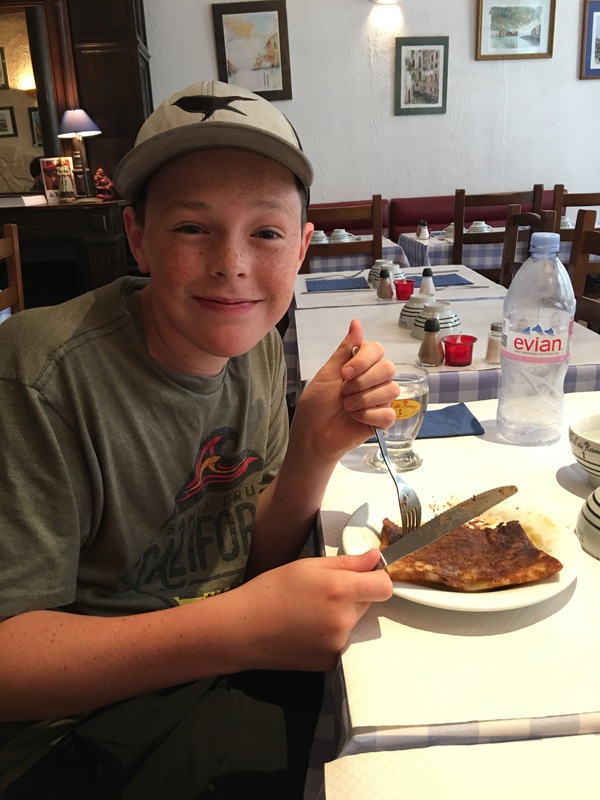 Luke’s favorite was the Nutella crepes! I don’t know if local people do this but it was fun for me. We really don’t do much shopping (except for food) in our travels. Firstly, because we don’t have any room to take anything with us and secondly, because I have three boys and a husband, none of which like to shop. However, on this day we had to shop because we found that each of the boys needed one more outfit. Jeromy and I could last one more day than them before needing to do laundry and we had a little room to spare, so each of the boys got one new outfit and I got to do a little shopping! This is a stretch to say a “local person’s house,” but I had to fit the pictures in here somehow! We went to The Palace of Versailles one afternoon and wandered through the halls of past French Royalty. We got there too late in the day to go through the gardens but the views from the palace were amazing. One other interesting thing was that there was a display on how the French Navy helped the United States during the Revolutionary War. I learned a lot about the important role France played in helping us gain our independence. It’s always interesting learning about history as told from another country’s perspective. Not only were we able to attend church at a local congregation of our own church (The Church of Jesus Christ of Latter Day Saints), but I had a very profound experience when visiting The Notre Dame Cathedral. 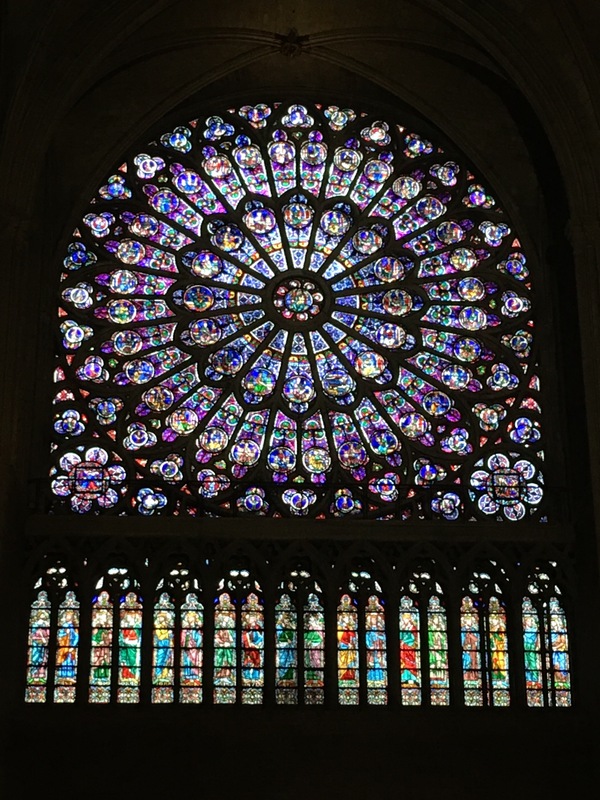 As I sat there in the Notre Dame Cathedral and said a short prayer, as I often do when visiting churches we visit in our travels, the feeling came to me of all the people who, for centuries have sat there praying in that same church. Mothers praying for their children’s good health, wives praying for their husbands to return to them from war, and the brokenhearted praying for peace in their hearts. It was a humbling experience for me to think about the generations of faith filled people of all kinds, who came searching for peace then, and the people who are praying for the same things today. Joan of Arc was a young peasant who claimed to see visions instructing her to help Charles IV of France in the 100 years war. She was sent in and is given credit for turning the tide of the war and paving the way for eventual French victory. On May 23 1430 she was captured, tried, and soon after burned at the stake at only 19 years old. She later was declared a saint and this statue was placed in Notre Dame in her honor. Since learning French people bought their food daily at little shops for each type of food in Mrs. Loubey’s class my sophmore year of high school, I knew I wanted to go to Paris and shop like that! 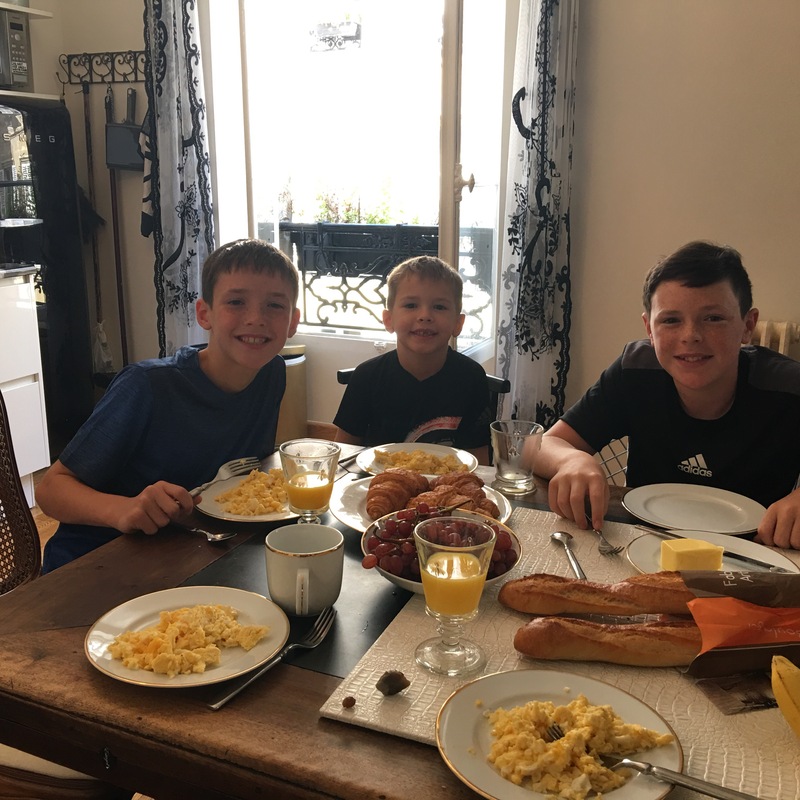 So it was with great pleasure I went out every morning to buy some fresh fruit, croissants, and baguettes for my family. 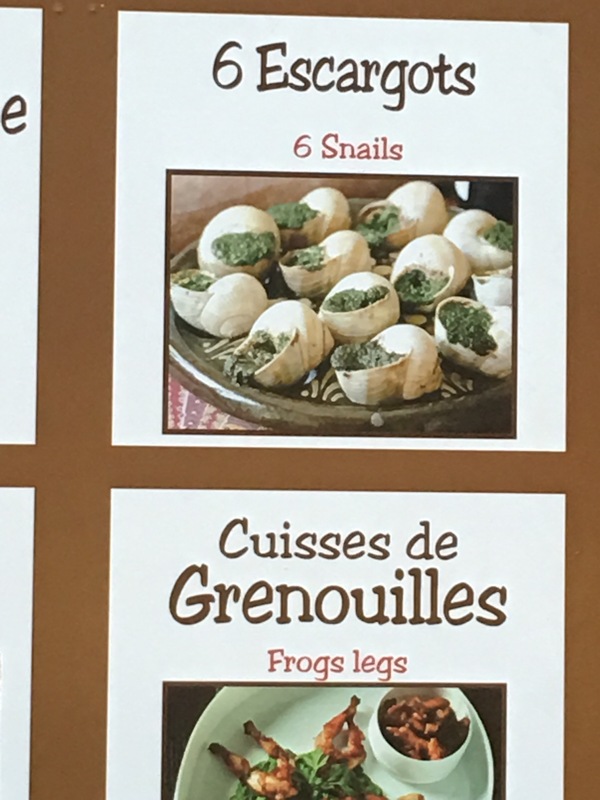 I love that the French make an experience out of eating! Americans are so efficient in everything we do. At home, I go to Costco and stock up with huge tubs of peanut butter and Nutella, get multiple loaves of bread (planning to freeze some) and stock up on my meat I need for a month. Living all the way out in La Center I’m not going to change to shopping everyday like this, but it was fun to do for the week while we were in the perfect place to try it out! The Clark County Fair (our local fair) was going on at home while we were in Paris. This is a highlight of the boy’s summer every year and as I saw all the posts on Facebook, I was sad to be missing it. 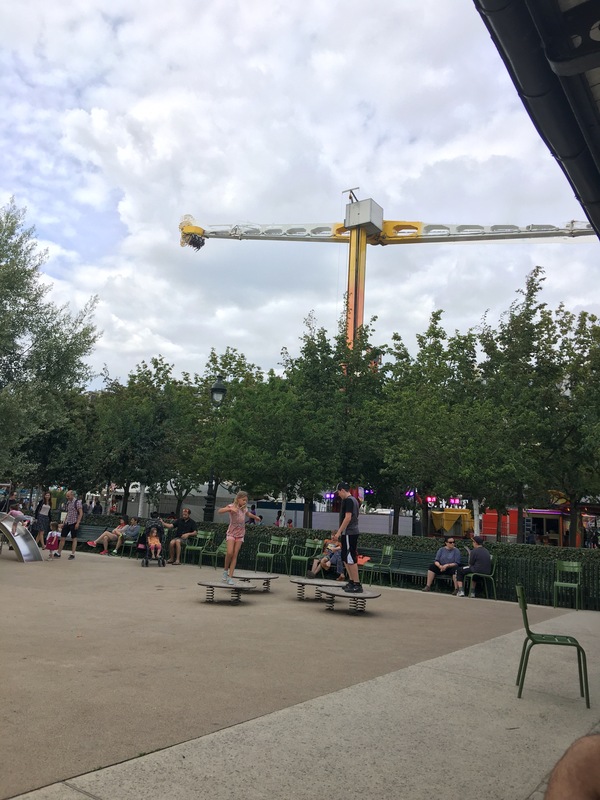 But low and behold what do we find in the Jardin des Tuileries but their local summer fair going on! 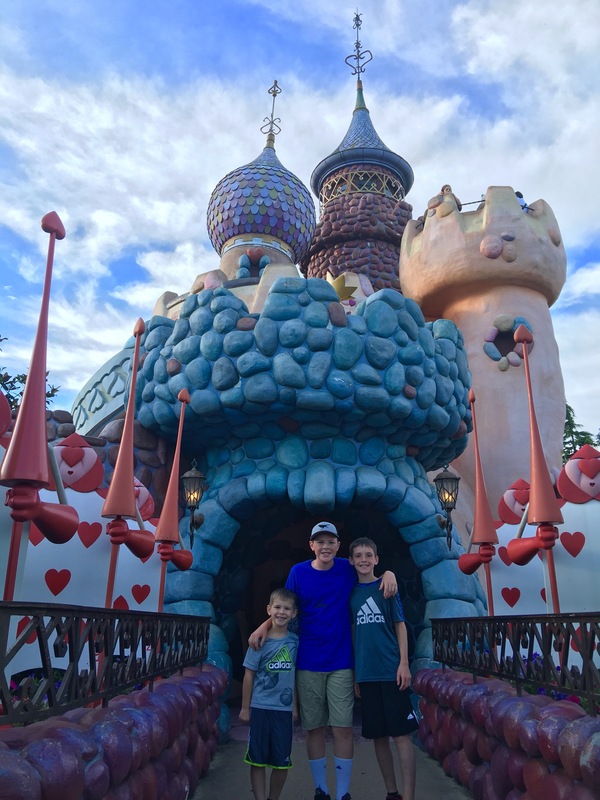 We had fun riding the rides and having just a little taste of what we were missing at home. 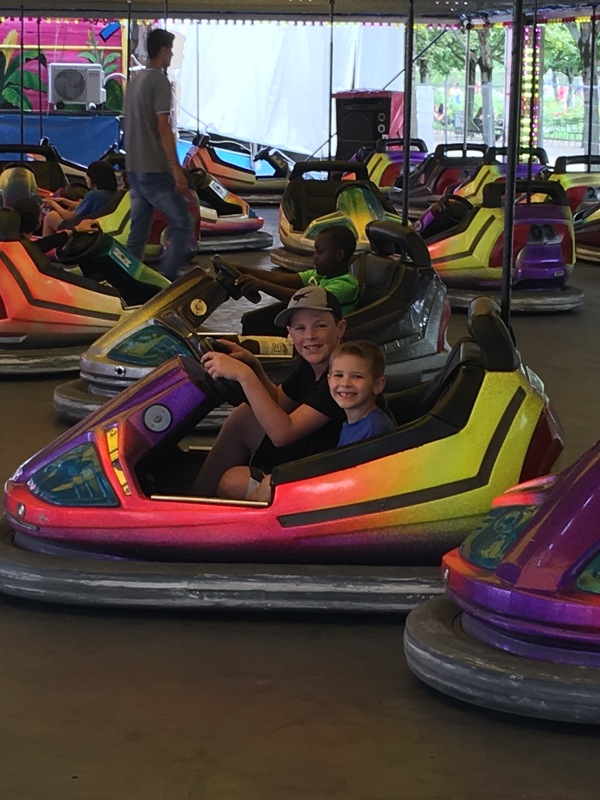 In the picture look beyond the cute park at the HUGE, yellow and white, sledgehammer like ride behind them. Tyler and I went on that and it was intense! I was sick for an hour after but it was pretty fun that in the first view I had of the Eiffel Tower it was upside down! 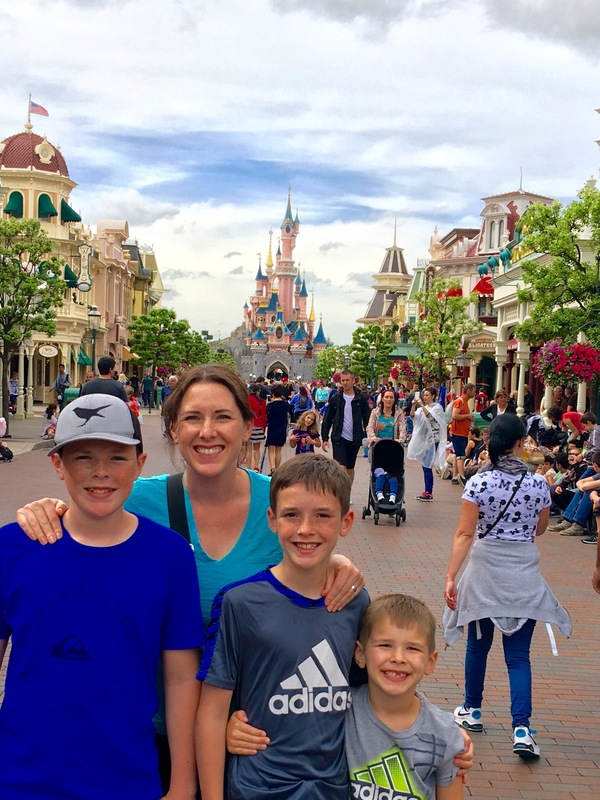 Ok, the Louvre and the Musee d’Orsay aren’t exactly “local museums” but we couldn’t leave Paris without going to see at least some of the masterpieces housed there. 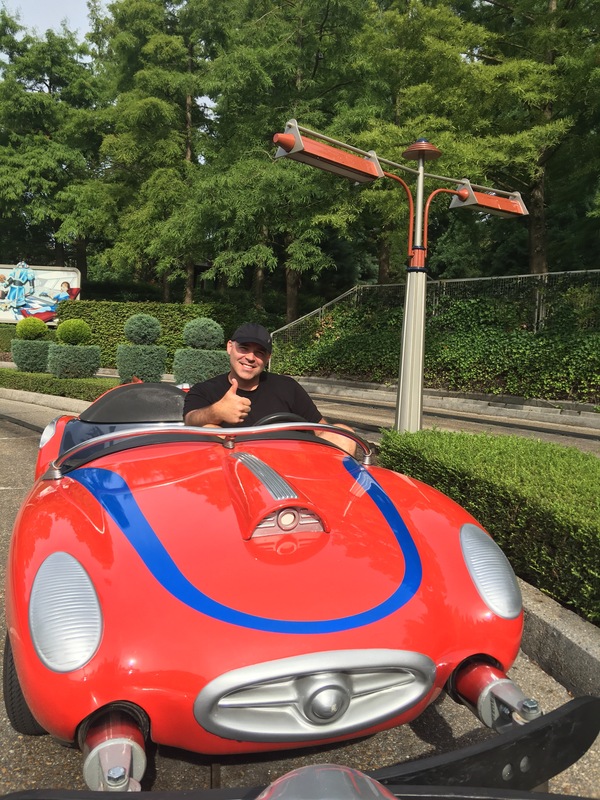 This is not a very Parisian thing to do, but Luke sure is cute being a tourist! Tyler’s favorite thing to see in the Loure was the Mona Lisa! The Louvre is huge and we couldn’t have seen it all if we had been staying in Paris a month, but we were able to see some pretty fantastic pieces of art, including this beautiful lady. Inside the Musee d’Orsay which was built inside an old train station. While it is small in comparison to the Louvre it is my favorite because it is so much more accessible, and I love impressionist art. The boys lasted for awhile, but grew tired of the museum before I did. Fortunately they were able to sit quietly playing chopsticks, one of our favorite games to pass the time, while I spent more time among some of the most beautiful art in the world. Paris is a walking city. You don’t want to take the Metro too much because around every corner is another beautiful building, neighborhood, or park. We logged lots of miles while in Paris, our feet hurt at night and Luke was wearing through the first layer of his shoes. We tracked our steps with an app on Jeromy’s phone and it was fun to see on all our stops how far we went in a day. 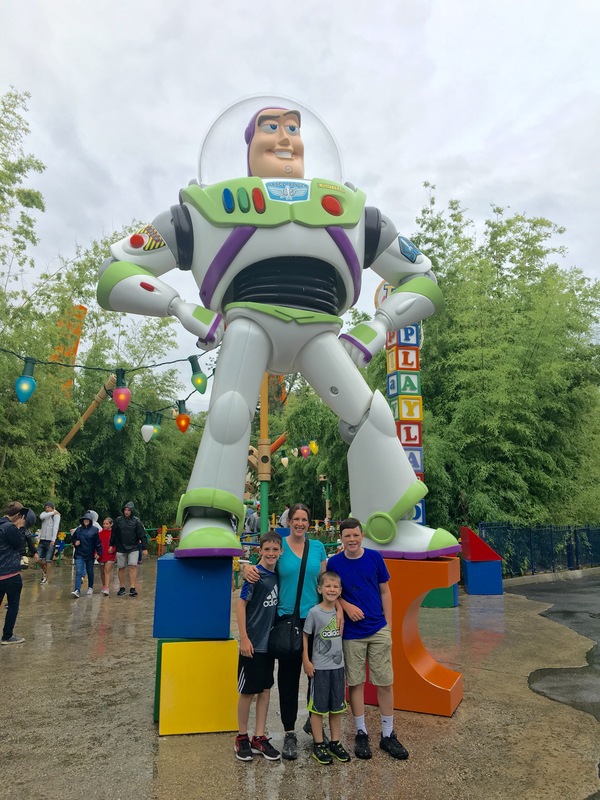 The crazy thing was that although we were taking tons of steps according to his phone, that didn’t count all the extra steps the kids took every time we stopped at a playground or park so we could rest our feet and the kids ran around playing! 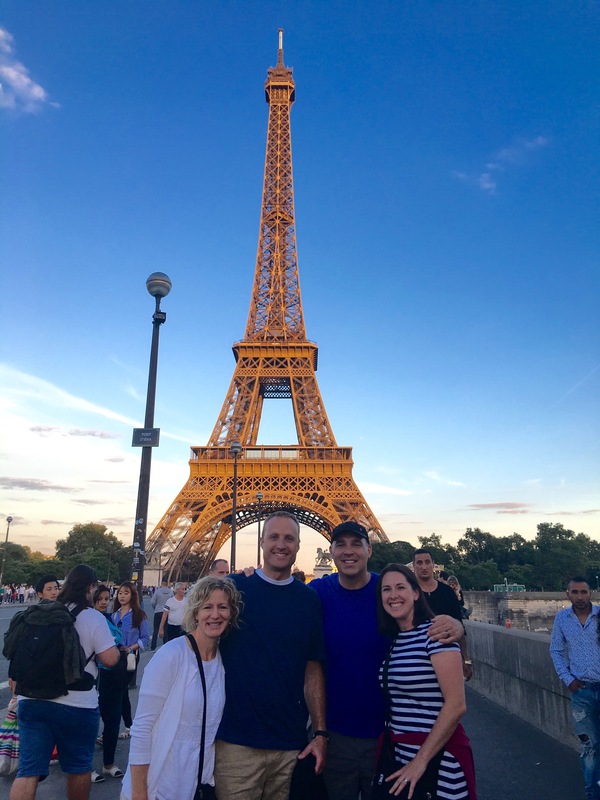 On our longest day we walked over 11 miles, over 31,000 steps, and we ended that day climbing up the stairs to the Arc de Triomphe at sunset. 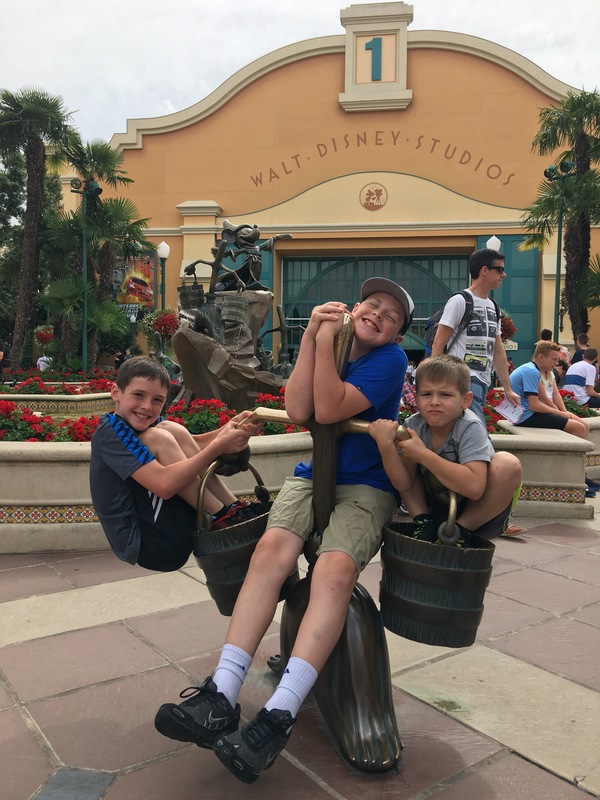 We have some pretty amazing children, especially Luke whose little legs probably had to do double the number of steps ours did! The Eiffel Tower from on top of the Arc de Triomphe. Once an hour the whole thing sparkles with lights. It is magical! While this is a pretty touristy thing to do, there weren’t many people there so it felt like we were in on a local secret. 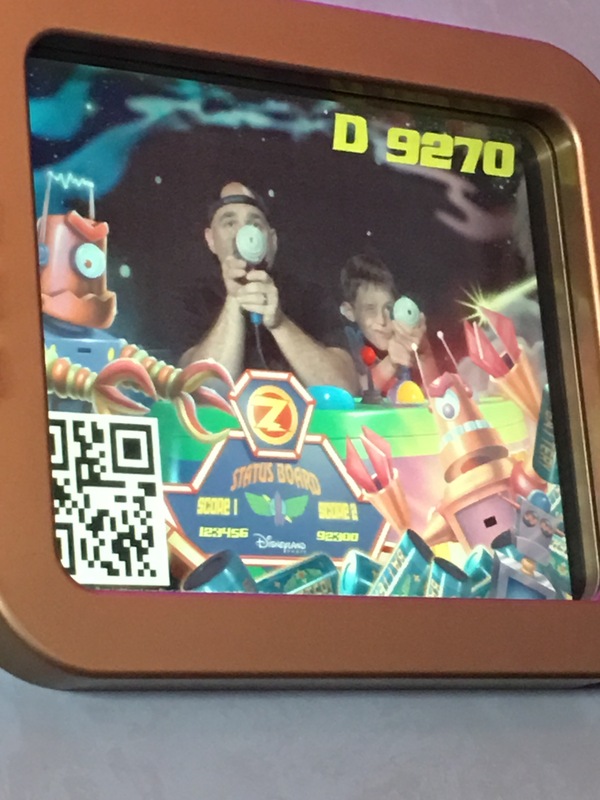 No lines at Disney! Yes, please!! 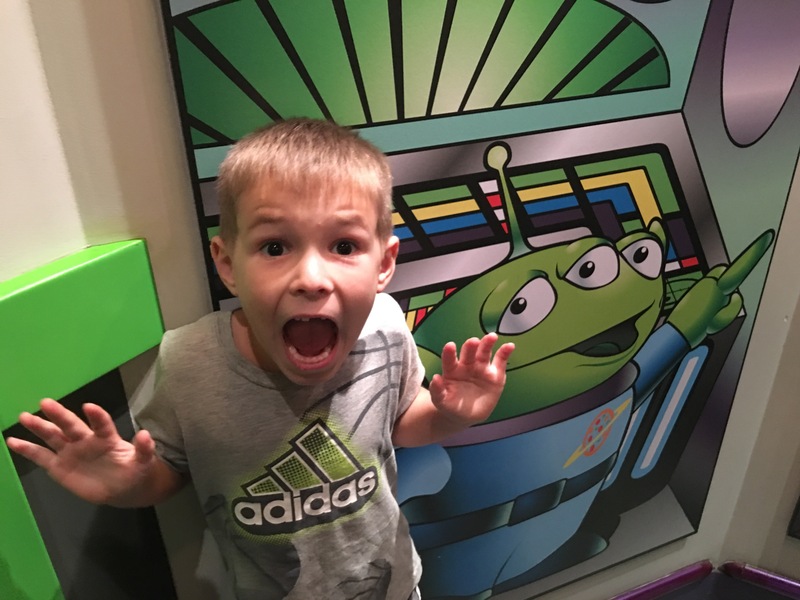 While it was a little smaller than the California and Florida ones, there were some rides we haven’t seen before in the Disney Studios Park, and the fact that there were no lines made it our kid’s favorite trip to Disney yet! 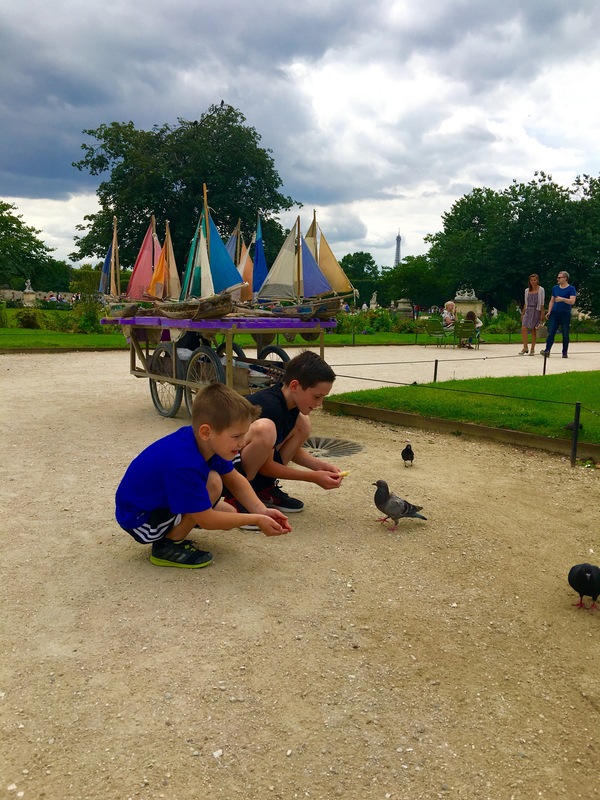 We really enjoyed our week in Paris and doing our best version of living like Parisians! I think we’ve got a lot to learn, but we sure had fun trying. Au revoir Paris…Ciao Roma! At the airport in Paris on our way to Rome! Thank you for allowing me glimpses of your journey! You inspire me. Thanks! I was just telling my husband about our mornings eating eggos after seminary.😀 Glad to hear from you! Soo cool for us to be a small part of your trip. Travel on! It was so great seeing you guys! Just what we needed. 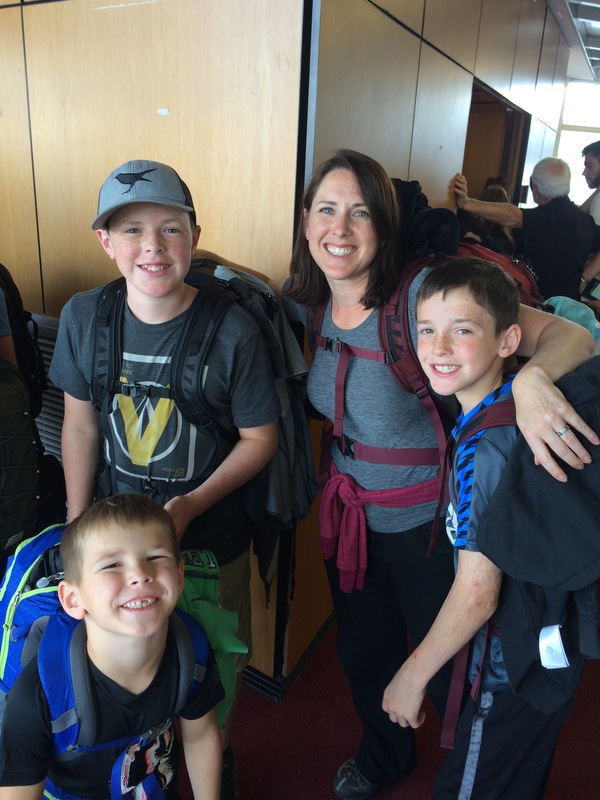 I’m so impressed by your completion of the Mont Blanc Trail in record time! 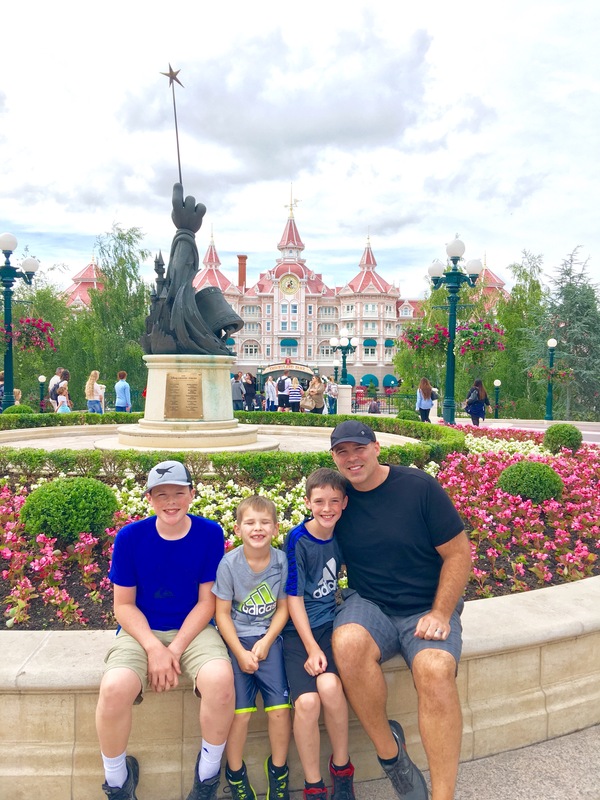 So much about this post I love…especially touched by your comments about sitting in Notre Dame and the common faith we all share in a loving God. Glad you enjoyed Paris, warm baguettes, and all things that make it magical. Un jour, j’espere y retourner avec ma famille aussi! Thank you. I hope you get to return with your family too! !